Tray jacks are very handy organizers found across the hotel and hospitality sector. However, they can get unsightly with repeated use. Tray Jack Covers can increase the aesthetic value of ageing tray jacks. These covers are highly demanded by professionals who regularly manage hosted events. This includes event hosting professionals who manage corporate meetings, tradeshows, receptions, and weddings. Tray jacks are also spotted at high footfall locations like casinos where property managers order tray jack covers in bulk. Not just hosted events, but guest serving areas like hotel lobbies also need tray jack covers in different colors to keep spaces frequented by guest clean at all times and to ensure garbage look better groomed. Tray jack covers help to upscale catering stations in a discreet manner, helping to create a unified, more professional look. 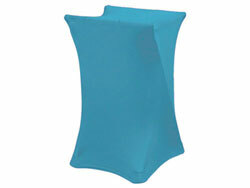 Why event planners trust form-fitting Spandex Tray Jack Covers? These tray jack stand covers are made from a unique spandex material blend that offers the maximum stretch along with enviable durability. These means lesser chances of tears and damage despite these covers being often exposed to sharp objects in the vicinity and rough handling. Please note that tray jack covers conform to standard fittings. The premium spandex tray jack covers come in more color choices to make your event better color-coordinated. From a wedding reception party to banquet spaces, all guest hosting areas can be tidied-up with the use of appropriate garbage can and tray jack covers. These professionally created covers have the right amount of stretch for that tight fit, a big reason why they are demanded across the hospitality industry. Trust tray jack covers to help you create that much wanted neat & clean appearance indoors & outdoors. Expect high-quality covers that easily wear a wrinkle-free look and are now available at never-before rates.